YOU are a Baby Carrier! You know, this past summer I attended the International Babywearing Conference in D.C. It was such a great experience to be among “my people”! In a session called “Practice, Not Product,” we were discussing different baby carriers, the tendency for those in the babywearing world to talk about one type being better than another, etc. For many of us, baby carriers are like pairs of jeans. Each type or brand will fit each person’s body and tastes differently. There is no one “best baby carrier.” There are so many! Some people prefer buckle carriers, some prefer the feel of fabric in a wrap or mei tai. Some people (like myself!) LOVE a ring sling, some have never been able to get the right feel. As a babywearing retailer and as a babywearing educator, my goal is to help you find the carrier that suits your individual needs best, or work with a carrier you have to get the best out of your babywearing experience. It was in this session that I had an “Aha!” moment… Having studied human development, I believe in the importance of holding your baby. Maybe not all the time, but certainly a lot. I believe babies come into this world expecting to be held, soothed, nurtured, and kept close. It was only a recent development in the span of human existence (the Victorian era wasn’t that long ago, when you consider all time) that we decided children should be separate from us and independent from the get-go. Those wonderful scientists who devoted their lives to studying the development of the human mind and body (and who I had to read again and again in college!) found that children need be dependent before they can be independent. They need to feel comforted, before they can learn to comfort. We nurture them now, because we want them to grow into amazing human beings who will feel it’s important to care about others and the world around them. And then it hit me… WE are baby carriers! We were given these fabulous things called hands and arms to take care of the child’s expectation to be touched and held. Without any device, you are a carrier. So, a baby carrier, as a product, is just a tool that allows us to use those other things called hands and arms to do the gazillion other things we need to do as parents these days, while still meeting that basic need. We know that when we fulfill the most basic needs on the pyramid, children are free to grow in every other area, cognitive (smarts!) and social-emotional (feelings). We come fully-equipped to carry our babies in our arms. Sometimes, we need some help…sometimes, we need our hands! Let QuirkyBaby help you find a carrier to match you and your baby’s needs. And are still carrying her today! Forward Facing Out (FFO), Hips, and Safety – a hot topic in babywearing! It’s that time of year! 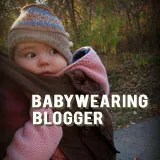 Cold-Weather Babywearing options at QuirkyBaby! © 2011 QuirkyBaby. All Rights Reserved.